July 31-August 1: This summer I am a guest faculty member at the Rainier Writing Workshop, PLU’s Low Residency MFA Program. Both days I am teaching a class titled “How to Manipulate Space and Time.” On July 31, I am co-teaching a workshop with Ann Pancake, and I am reading with Brenda Miller at 7PM in the Scandinavian Cultural Center. August, 2016: I am teaching a class on writing in multiple points of view at Hugo House. July 20-31, 2016: I am doing a residency at the Hambidge Center for the Creative Arts. June 20, 2015: Between July 21 and August 2, I will be a fellow at this year’s Sewanee Writers’ Conference. April 10, 2015: My essay “Blood Brothers” is part of the Being: What Makes a Man anthology (University of Nebraska Gender Programs). If you go to the Amazon site you can “Look Inside” to read the essay. Then go buy the book! It features 18 different authors, including David Shields and my former teacher Lee Martin. Thanks to Jill McCabe Johnson for helping with this piece and for including my work in the anthology. February 14, 2014: LitChat has asked me to serve as a contributing editor, speaking to the craft of writing and teaching writing. Here is my first post, that looks at the ways running is part of my writing process. In it I speak to how I started running by doing laps in my apartment, dressed like Matthew Modine in Vision Quest. August 15, 2012: HUSTLE announced as a finalist for the PEN Center USA Literary Award for Fiction. May 18, 2012: BOOKSLUT has posted an article by Colleen Mondor titled “We Can’t Choose Our Families,” discussing HUSTLE along with five other recently released novels that center around adolescents struggling to survive their idiosyncratic and difficult families. May 1, 2012: THE SENTINEL posted this article by Joyce Hargrove on the setting panel that I did with Lori Ostlund, K.L. Cook, and Jonathan Frey at the GET LIT! Festival. December 12, 2011: Interview with Craig Lancaster on his website MIND ADRIFT IN THE WEST where we talk about my infatuation with Xanadu, the dirty life of book touring, and anthemic punk rock. December 5, 2011: Article in THE WESTERN HERALD by Kassie Charnley about my reading in the the WMU Frostic Reading Series with Melinda Moustakis and Elizabeth Knapp, including some of my advice to writers (as if…). December 1, 2011: Radio Interview with WMUK (Western Michigan University’s Radio Station) where I got to DJ. November 13, 2011: Radio interview in conjunction with the Miami International Book Festival. September 30, MIDWEST BOOK REVIEW “highly recommends” HUSTLE. September 28, 2011: EXAMINER gives HUSTLE four stars. September 23, 2011: TOOTHY BOOKS gives HUSTLE four stars. September 7, 2011: My 20 city Book Tour begins at BookPeople in Austin today. See the Events page to know if I’m headed your way. August 14, 2011: Interview with Brian Seeman at WORD/SOUND. August 4, 2011: NEWPAGES.COM selects HUSTLE as a new and noteworthy book. July 30, 2011: Interview with Tom Cantwell at NORTHWEST BOOK LOVERS. 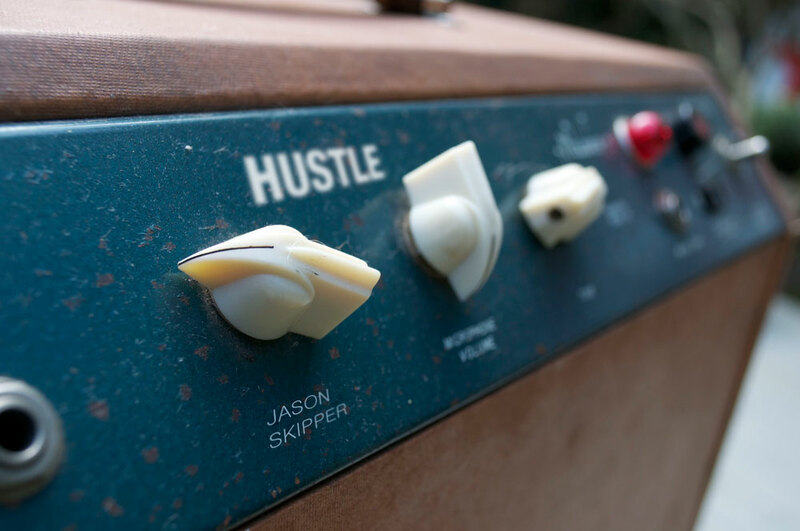 June 21, 2011: First Article about HUSTLE, by Rosemary Ponnekanti at THE NEWS TRIBUNE. June 21, 2011: HUSTLE is now available!